Bhikkhu Thanissaro—prolific translator of Buddhist texts and a member of what I called the League of Extraordinary Gentle-Bhikkhus—has a great article in Tricycle debunking the idea that the Buddha taught that there was no self. Not only that, but he shows how a teaching the Buddha rejected became seen as his central doctrine. This emphasis on the self not existing is often paired with the expression “anatta doctrine” or “no-self doctrine,” as if this was something the Buddha actually taught. 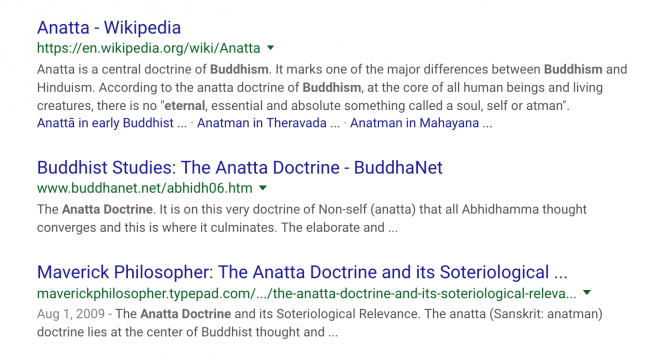 Here are the first three results for “anatta doctrine” that came up on Google. And yet there is no “anatta doctrine” in the Buddha’s teachings. 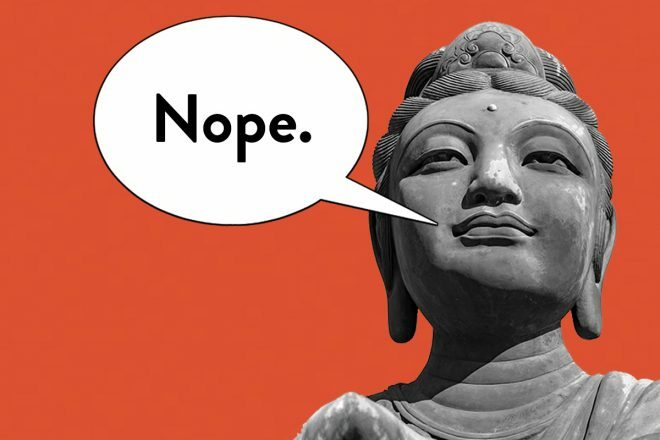 The Buddha isn’t saying “there is no self.” He’s encouraging us to stop identifying anything as being our selves, which is a very different way. The purpose was to get us to let go of having any view of self. It was not to come to the realization “I have no self”— which would be just another view of self. Again, this is not saying that there is no self. Just that we should see nothing as constituting a self. The view I have a self arises in him as true & established, or the view I have no self … This is called a thicket of views, a wilderness of views, a contortion of views, a writhing of views, a fetter of views. Bound by a fetter of views, the uninstructed run-of-the-mill person is not freed from birth, aging, & death, from sorrow, lamentation, pain, distress, & despair. He is not freed, I tell you, from suffering & stress. Now I confess that sometimes I do say that the self doesn’t exist, but I try to be careful to qualify that by saying that this means “the kind of self you think you have doesn’t exist.” We like to think that there’s something in us that is unchanging, separate, and has agency, and that this constitutes our essence, or true self. Nothing like that exists. And that’s what the Buddha is pointing too. Perhaps my talking in that way is potentially misleading, so I’ll rethink whether perhaps I should change the language I use. Anyway, do go check out Bhikkhu Thanissaro’s article. It’s worth a read. Tricycle magazine, which is a large, glossy, quarterly Buddhist magazine, has an interview with me today on the theme of Fake Buddha Quotes. Posted on October 3, 2018 December 16, 2018 Categories Other11 Comments on Spotted in the wild! Do pre-order! 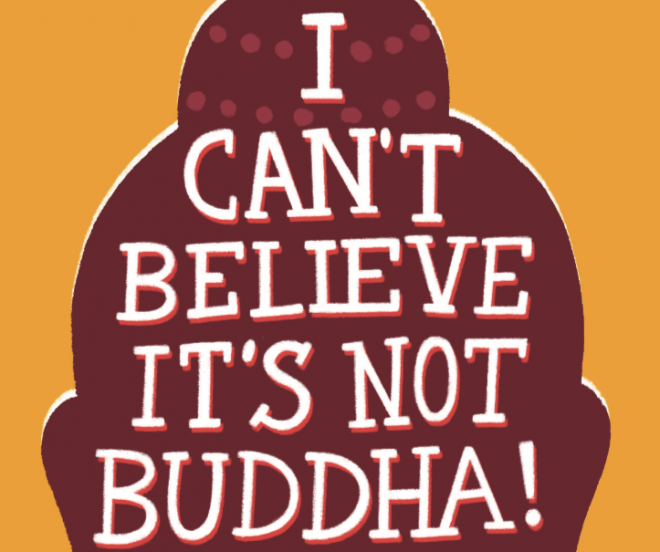 Even if I say so myself “I Can’t Believe It’s Not Buddha” is a great read, and would make a fantastic holiday gift. Posted on September 15, 2018 Categories OtherLeave a comment on The excitement is building! 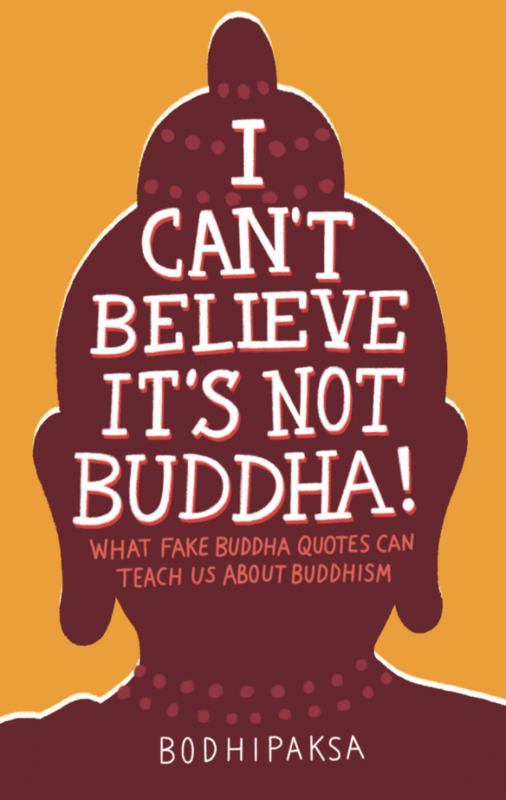 If you’re still on the fence about buying my book on Fake Buddha Quotes, I Can’t Believe It’s Not Buddha, which you can preorder now, check out the following comments from fans of this blog! Yay! After many weekends and evenings of slaving over a hot MacBook Pro with 2.4 GHz Intel Core i5 processor, 8 GB 1600 MHz DDR3, and 256 GB SSD, my book on Fake Buddha Quotes is now on its way to the printers and available for preorder! 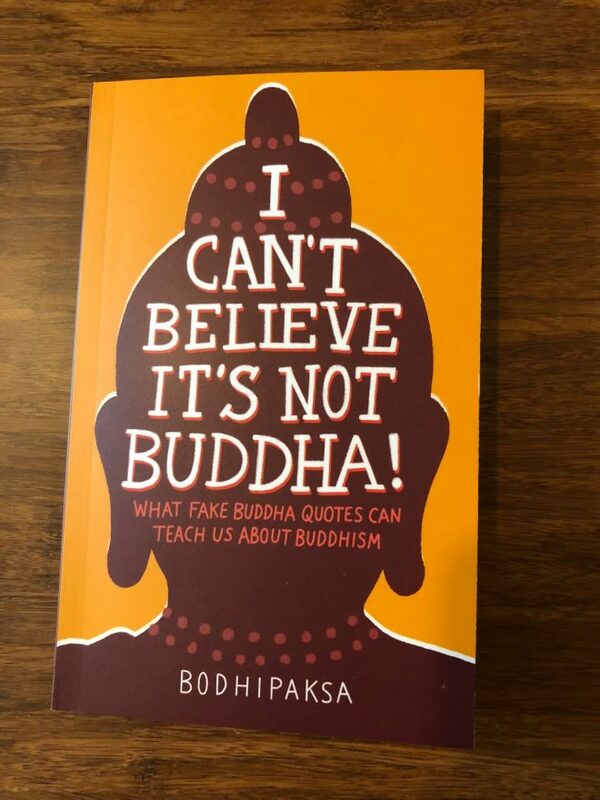 If there’s a mildly pedantic Buddha Quote Fan in your life (and we both know I’m talking about you) this will make the perfect gift! And if you have friends who annoy you by sharing Fake Buddha Quotes on Facebook you can annoy them right back by giving them a copy! 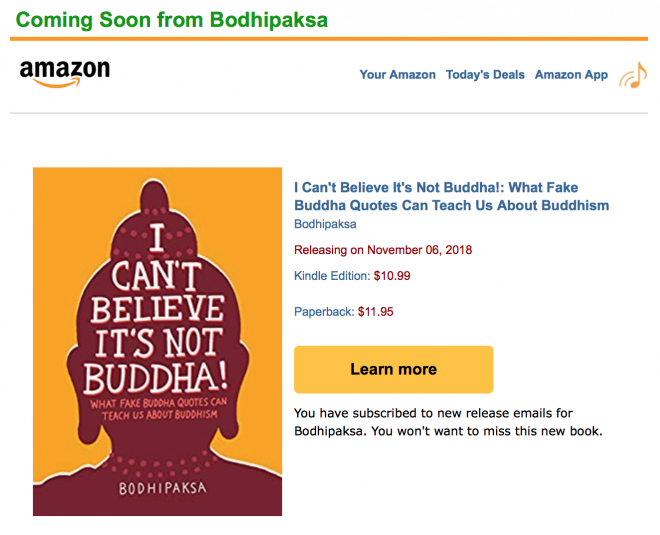 Posted on August 10, 2018 October 3, 2018 Categories Other2 Comments on “I Can’t Believe It’s Not Buddha!” is now available for preorder!!! Awful pedants of the world, unite! 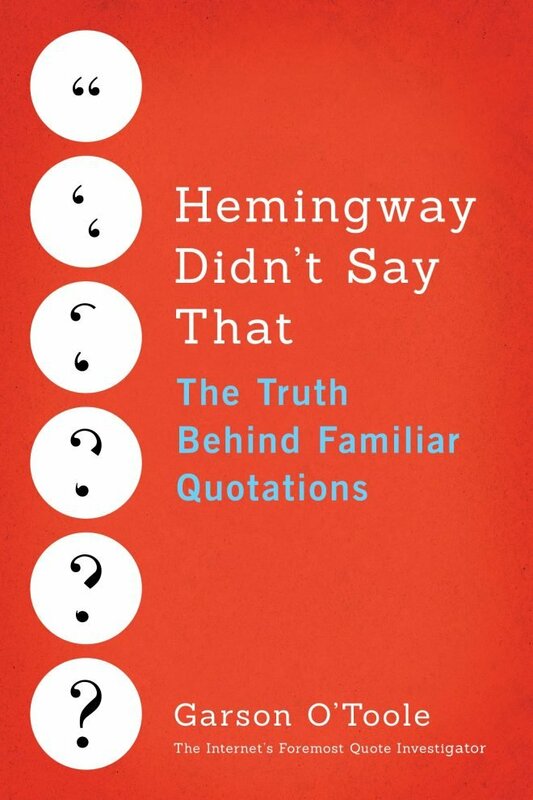 NPR has an article inspired by Garson O’Toole’s new book, Hemingway Didn’t Say That: The Truth Behind Familiar Quotations, investigating the phenomenon of the torrent of bogus quotations that flow through social media and occasionally make the people quoting them look foolish, as when the Republican National Committee tweeted a picture of the Lincoln Memorial along with the quote, “‘And in the end, it’s not the years in your life that count; it’s the life in your years’ — Abraham Lincoln,” and when the US Postal Service put a misattributed quote on a stamp dedicated to Maya Angelou. The puthujjana is not to be despised (it’s a term for any person who has not attained the first stage of enlightenment) but early Buddhism was certainly not democratic and did not see the mass of unawakened individuals as a source of guidance, and instead looked to those who had, through skill and hard work, developed insight and wisdom. If you’d like to distinguish yourself from most people (and I hope you do) then I hope you’ll get a hold of Garson O’Toole’s new book. Any book that sparks intellectual curiosity and a concern for accuracy is, in my opinion, worthwhile. And you can quote me on that. Posted on May 17, 2017 May 22, 2017 Categories OtherLeave a comment on Awful pedants of the world, unite! I just stumbled across a paper called “The noble art of misquoting Camus — from its origins to the Internet era,” by philosopher and Société des Études Camusiennes member, Giovanni Gaetani. The real importance of misquotes – and mistranslation as well – is undervalued. Whether they are big or small, hidden or manifest, made in bad or in good faith, they are always compromising because their inevitable destiny is to generate false commonplaces to be used either for or against the author. Indeed, while a specialist can probably detect at first glance the misquote or the mistranslation, the average reader – that is, the vast majority of an author’s audience – is condemned to believe to what he sees, no matter how disappointing it is. This is actually from a children’s song from a Jewish summer camp.